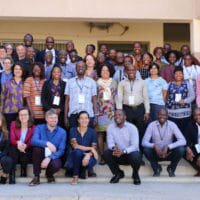 The annual LIRA Research Forum took place from 25 to 28 March 2019 in Dakar, Senegal. During the forum ACC’s Sylvia Croese, principal investigator of the project Co-producing urban knowledge in Angola and Mozambique through community-led data collection: towards meeting SDG 11, presented a project update along with project members Massamba Dominique of the Development Workshop, Luanda, Angola and Inês Raimundo of the Eduardo Mondlane University, Maputo, Mozambique. Croese reported that good relationships and close collaborations have been forged with local stakeholders in each of the research cities which has led to a better understanding of local needs and interests. However balancing these local interests and needs with the research agenda as well as mediating between competing or conflicting stakeholders interests remains a challenge. Progress has been made in the fieldwork with the first phase of data collection (desktop, surveys, site visits, key informant meetings and focus groups) completed in Luanda, while still ongoing in Maputo. The next step is data validation and presentation of the results. Several project presentations as well as an article for the International Science Council entitled Grounding stats and the SDGs in co-produced local data have been completed with an article on the Luanda work in progress. Croese also noted that through the engagements so far there is a greater awareness of SDGs on the ground and this has also resulted in the creation of an SDG working group in Luanda. Learn more on the project and it aims here.